Cassidy scored the cheapest of political points Friday, which is both brilliant and stupid. It was a Friday in Congress with no significant votes on the docket, just a discussion about sending money and weapons to the Middle East. The U.S. Government was in the midst of a shutdown — the announcement of our government’s temporary re-opening had yet to come. That made it the perfect possible time for one senator to … pander to the home crowd with a little discussion about football. Yup. The growing wave of complaints of Saints fans cheated out of a Super Bowl 53 appearance crested to a logical escalation Friday. In the span of five days, New Orleans has leveled up from punched televisions to billboards to change.org petitions to class action lawsuits, and now, a debate on the floor of the United States Senate. Was it weird that Senator Bill Cassidy called the fans watching the NFC title game a bunch of drunks? Sure! Was it reminiscent of Jonah Ryan rallying against school lunches in Season 6 of Veep? Kinda! Will Congress actually do anything to affect the outcome of a game played five days ago? Nope! Cassidy’s speech came hours before President Trump announced he’d end the longest shutdown in American history for three weeks time. On this same day, a major airport in one of the largest cities in the world briefly grounded its departing flights due to a shortage of federally paid air traffic controllers. Needless to say, there’s a lot going on right now … and we’re talking about football! Not even in the cutesy “I’d like to make a resolution honoring the Clemson Tigers for winning a national championship” way, either. 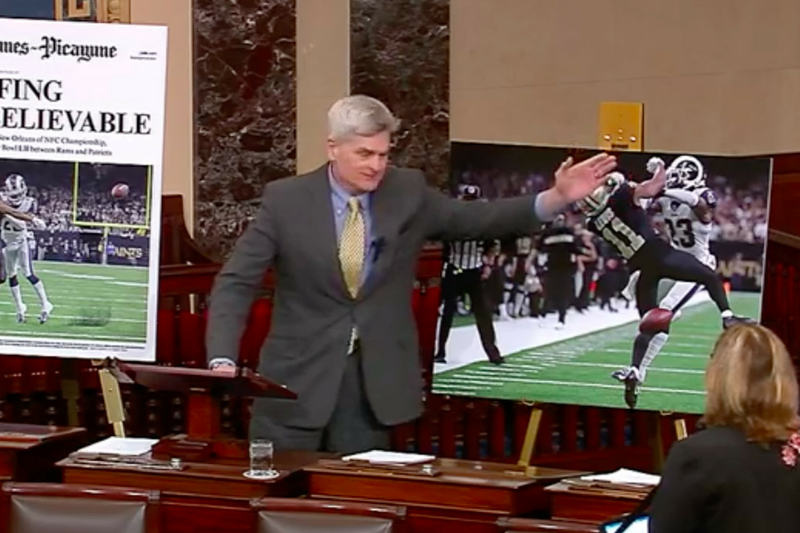 Cassidy starts his argument with some lip service to the shutdown, but this presentation is all about one thing — football. He cites Hulk Hogan, yet cannot name any of the players involved in the controversial play aside from Drew Brees. This is doubly impressive because he has a giant, blown-up picture of the play in which Tommylee Lewis’ “LEWIS” nameplate is clearly visible. He brings up “the integrity of the game,” which, somewhere in New York City, silently made Roger Goodell perk up and nod silently to himself. He suggests the referee who missed the call may have been biased because he lives in California, a state that wasn’t home to the Rams between the years of 1995 and 2015. He admits he doesn’t actually know how officiating crews are assigned to playoff games — a Google search that takes literally eight seconds to complete. cheapest of cheap political points at a time where there were simultaneously bigger fish to fry and nothing, really, to do. He knows there’s nothing meaningful the U.S. Government is going to do to reverse one blown call in an NFL playoff game, but he’s still going to be able to tell voters “hell, I tried” when he’s rubbing elbows with voters in Metairie. It’s dumb and brilliant at the same time, a speech Cassidy can pull out at LSU tailgates and stick in the face of every opponent he’d like to hear say “well, he’s not all bad.” With the news of Trump’s decision to temporarily halt the shutdown, it’ll be lost to the ever-churning news cycle but remain in Cassidy’s archives, waiting for the right time to resurface. Just don’t confuse his argument for actual caring. And don’t think this will lead anywhere but to campaign ads in the New Orleans television market come October 2020.